Simply Immersive Introducing the all-new VIZIO SmartCast 45" 5.1 Sound Bar System. Combining high-caliber audio with elegant style, and Google Cast built in. What you love won't change, but how you experience it will never be the same. Sound That Moves You From the roar of a crowd to the screech of a car chase, experience every detail in amazing clarity as loud as 104 dB2 with less than 1% Total Harmonic Distortion. Bass You Can Feel From the rumble of a concert to the pulse of your party playlist, the slender wireless subwoofer delivers roof-shaking bass as deep as 30 Hz. Slender Form Factor Crafted to command uncompromised sound from a slimmer compact design. Slim Profile Subwoofer With a thinner minimal design and detachable legs, the new subwoofer allows a horizontal or vertical position that fits conveniently beside or beneath your furniture. Experience VIZIO SmartCast VIZIO SmartCast brings together your favorite entertainment into one simple experience. 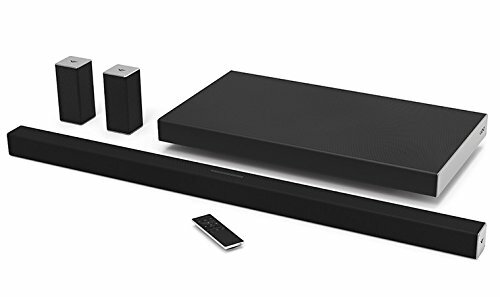 Discover, cast and control your music on your Sound Bar from your mobile device using VIZIO SmartCast App.1 1Minimum requirements: Android 4.0 or later (to use the Bluetooth functionality you must have android 5.1 or later), IOS 8.0 or later, subject to change. Turn Your Phone Into The Ultimate Remote Easily set up and control your Sound Bar like never before with the VIZIO SmartCast App.1 1Minimum requirements: Android 4.0 or later (to use the Bluetooth functionality you must have android 5.1 or later), IOS 8.0 or later, subject to change. Download for free on the App Store and Google Play. VIZIO SmartCast App Download the VIZIO SmartCast app to turn your smartphone or tablet into a powerful touchscreen remote. Search and browse content across multiple apps at once. Control multiple VIZIO SmartCast sound bars or speakers from anywhere in your home. Cast From Apps You Already Know and Love All VIZIO SmartCast audio products have Google Cast built in – the same technology behind Chromecast – which allows you to cast your favorite content from your phone to your TV / Display or Sound Bars. Access millions of songs, podcasts and more. Elevated Engineering VIZIO SmartCast Sound Bars are crafted with custom drivers and technologies from the industry leaders of audio. The refurbishing process includes functionality testing, inspection, reconditioning and repackaging. The product ships with relevant accessories and may arrive in a generic white or brown box.